Many people choose to get their puppy at a time when they are going to be at home for a few weeks to allow the puppy time to settle in. This is a great idea as it allows you the chance to bond with your puppy, and for you both to learn about each other. It also means that you have time to start putting your toilet training plans into action, and you can be much more tolerant of the odd sleepless night if you don’t have to get up for work the next day! During this period, it is very important that you separate from your puppy for short periods of time when he is awake. By doing this from an early age, starting with very short periods of a few minutes, and building up the time, your puppy will learn that you can be separated without anything bad happening to either of you. If you are using a crate, you could pop the puppy into his crate with a toy that he can chew to entertain himself for a few minutes whilst you disappear out of sight. Try not to rush back if you hear him crying, unless you are worried that he may genuinely harm himself. If you are not using a crate, create a safe, enclosed space for your puppy where he will have his bed, some water and a toy, and from where he can’t escape to follow you. By doing this regularly, and extending the time, you will be preparing your puppy for times when he will be alone in the house. The next step is to leave the house. You can stay close and listen to how your puppy copes with this but, again, try to stick to your plan and don’t be tempted to rush back indoors as soon as you hear a whimper as this will teach your puppy that he can summon you back by crying. Clearly, the last thing we would want is a distressed puppy, but this should not be the case as you are not expecting anything unreasonable from your puppy, and he should calm down after a short time. Keep extending the time, and extend your separation by going to the shops and returning home, or walk around the block…just enough that you are away from the house but not too far away. Listen out for sounds of crying before you open the door to re-enter the house. If your puppy is quiet, or even asleep, then you are making progress. Unless you take some steps to teach your puppy to separate from you, you may be inadvertently causing the behaviour of separation anxiety and struggle to ever leave the house without him. A dog who can’t bear to be separated from his owners can become very stressed, create a nuisance for neighbours if he barks and whines throughout the day. This can lead to issues that may make your life miserable. 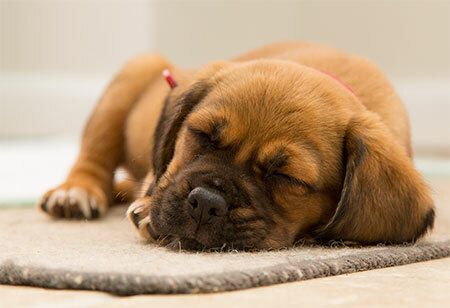 It is vital that your puppy is allowed to rest and sleep whenever he needs to. The immediate area around your puppy’s bed or crate should be for his use only. This will become his safe area. It is particularly important that children are taught the importance of allowing a puppy to sleep. If the puppy is resting in his bed or his crate, nobody should approach and disturb him. Puppies need lots of sleep. Bursts of high-energy play will usually be followed by a need to toilet, or to sleep, or both. You will find that a tired puppy will be much more difficult to control than a well-rested one. Excessive mouthing and other challenging behaviour can often be caused by a lack of sleep. Owners often call us out to ‘aggressive’ puppies when they simply have an overtired, over stimulated puppy. Very early on, start to introduce your puppy to sounds and items that he will encounter on a regular basis. Introduce him to the vacuum cleaner, the hairdryer, the brush and the bath tub as soon as you can and as gently as you can. Handle his paws and toes on a regular basis to get him used to grooming and nail clipping. Make the experiences as pleasant and unthreatening as possible, so that you don’t create tension and cause your dog to fear these things. Before his vaccinations and before he is allowed out you can accustom him to sights and sounds in different parts of the home. Guide him to the places where you want him to explore and don't be tempted to pick him up too often as this can encourage unwanted behaviour. Even before he is allowed out on lead, you can start to accustom him to it. Encouraging him to walk inside the home will prepare him well before his big day out. Once your puppy is allowed out into the World, don’t overwhelm him or rush to socialize him with loud noises. The same goes for other adult dogs on the park. It only takes one bad episode to imprint into a dog's mind and this one episode could stick with him for many years to come. Speak to your veterinary practice to find out about puppy socialization classes where your pup can meet and play with other puppies. Using group classes for puppies can also be a good idea for socialising. Keep your puppy on a lead for the first 12 months of his life, whether you are out in the street or at the park, so that he can’t rush up to unknown adult dogs. The reason for this is that puppies haven’t learnt the rules of dog socialization etiquette and can easily overstep the boundaries of good manners if they bound up to and leap all over an adult dog. This can result in them receiving a strong correction from the older dog, and may make them frightened of other dogs… something that will make your life more difficult than in needs to be! Do allow him to socialize with friends’ dogs, or dogs that you know to be friendly, but you should still keep him on the lead so that you can remove him from the situation should one of the dogs become overly assertive.